Only 10 minutes from Naha Airport by monorail! Check-in, rent a car at our lobby desk and enjoy Okinawa! FREE Take-away breakfast is also included! Located in front of the Monorail Station "Tsubogawa", Mercure Okinawa Naha is connected to Naha Airport in only 10 minutes, and just a 5-minute walk to the Naha Bus Terminal. Get your car right after check-in thanks to the Rental Car Desk in our Lobby. The hotel also offers a Bistrot and fully-equipped Meeting & Event facilities, making it the perfect place both leisure & business travelers. A short distance from the Kokusai Dori the Main business, shopping and entertainment street of Naha. 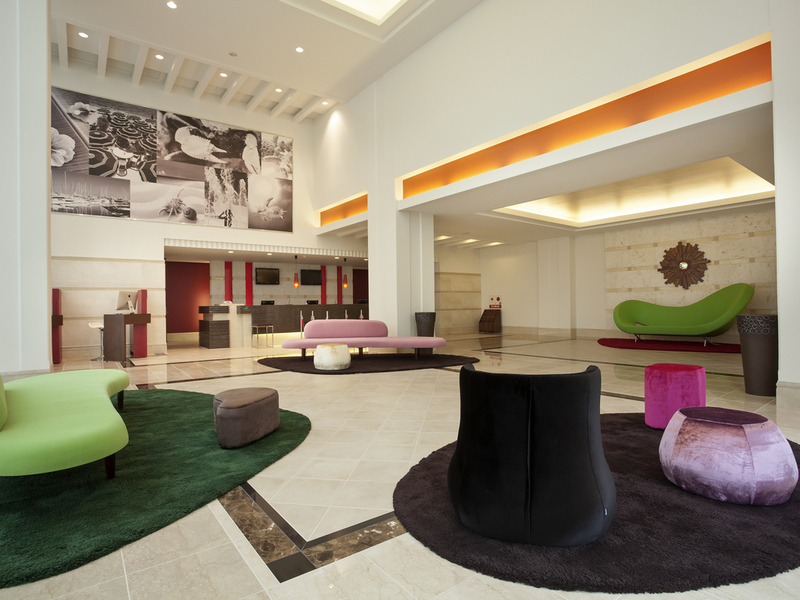 The ideal gateway to the many sightseeing places in Okinawa which makes it the perfect hotel for business and leisure. Surrounded by pristine beaches, Okinawa is the perfect destination for watersports like snorkelling, canoeing and scuba diving. Various events are also held throughout the year for you to experience the unique Ryukyu culture. FREE Take-Away Breakfast is given to all guests for Room-only bookings! Perfect to enjoy in the room, on your way to the beach or in the plane. FREE Take-Away Breakfast is included in all Room-only Booking! Upgrade to full Breakfast Buffet is only JPY 1200 per person and free until 12 years old. Consider our Rental Car Package, including car rental at special price and free parking! FREE Take-Away Breakfast is included for all guests in Room-only bookings. Overall we are very satisfied with this hotel. It is very friendly and generous. They gave a small basket of bake sweet and a set of L’Occitane to my partner as her birthday gift, what a surprise! We really appreciated it. Great location as the Yu rail stataion is just in front of the hotel, very convinient. Friendly staffs. near to train station, nearby food and groceries store, good location. In-house car rental was convenient and affordable. If we can return it anytime instead of by 8pm on the day, would have been better. Usual Japanese efficiency and cleaniness, spacious room for 2. Its a pleasure to stay with Mercure Okinawa. ・Mercure Okinawa Naha is situated near the Tsubogawa monorail station, it is very accessible from/to Naha airport. ・Employees are very polite, when i checked-in, a female receptionist recommended me late-checkout, and i felt she tries to provide more service. ・The room is comfortable and kept clean, especially the bed, it is my favorite. ・In breakfast, there are variety cuisines, i like Okinawan local foods(noodle, rafute, taco-rice etc). ・The hotel prepared the upgraded room for me...and i stayed with luxury and happy days. Good​ atmosphere, Good​ serviece,Good​ security, the​ food​ was​ fairly good, easy to​ travel​ ​ because​ it​ close to​ Yui rail and​ it​ has Family​ Mart​ near​ the​ hotel​ but​ the​ room​ was very small and​ the​ hotel​ should​ have​ more facilities such as​ fitness room, swimming pool or​ kid club. Front desk folks were very welcoming, great breakfast and location. Location is perfect. Staff friendly. Room good. Great staff on reception. Handy snack pack for breakfast when heading out for the day. Unfortunate that restaurant was not open for evening and no bar for a relaxing drink after a busy day. Good location connected to monorail. Good side is that services are good and staffs are willing to go extra miles to serve clients such as late check out and room upgrade. Down sides are hotel has no swimming pool, no gym facility, no bar, and no room services. Thank you very much for staying at Mercure Okinawa Naha and thank you for writing a comment about your experience in our hotel. We are glad to know that you found the location of our hotel convenient. Indeed, there are lots of supermarkets nearby and even a drugstore. Yui rail is also just situated in front of our hotel, which makes the access to the downtown and airport easier. Also,we are glad to hear that appreciated our front desk staff during your stay and that you liked our hotel. However we are sorry for the fact that no leisure facilities are provided in our hotel. You may know that in the park situated just in front our hotel, you can find such facilities. There are a swimming pool, an athletic field and a gym center. Thank you again for sharing your experience to us, and we hope to see you again at Mercure Okinawa Naha. I have expectations of a 4 or 5 Star hotels in every country i visit.However, mercure hotel experience was amazing..i had a warm welcome, the hotel rooms were great, the scenery from the rooms was awesome and the Monorail station was just beside the hotel.Recommended for its breakfast and rooms. It was relaxing and cozy as transportation is very comfortable to go international street by monorail. In addition hotel provide complementary gift box for breakfast such as bread and drink. It’s was good especially for the extremely clean hotel room and the unexpected free breakfast. The hotel staffs were very friendly and helpful. We stayed on March 22 2019, were surprised with the drink machine at the lobby and the provision of token to access the drink machine. We pay for breakfast at hotel, were satisfied with the wide spread of choices available. Thank you for a great stay ! Room a bit small but clean. Room provide a Wi-Fi phone can be use for local call and internet access is a advantage to me, especially for family trip, can use for room to room call or local call when we are separated when outing. Stay for 6 night, Breakfast almost the same everyday, a bit boring. Staff are very helpful and nice. Rooms are clean. Very close to monorail station. Close to airport, only 10 mins away from airport by monorail. Even no breakfast included in the room rate, still provide us with take-away breakfast.